Cut the cauliflower into florets, discarding the tough inner core. Working in batches, pulse the cauliflower in a food processor until it breaks down into rice-sized pieces. You should have about a kilo of cauliflower "rice." Whisk the eggs and pour them into the pan. Quickly scramble the eggs or make an omelette. Transfer the eggs to a cutting board and roughly chop into pieces. Wipe the pan clean and warm 1 tablespoon of vegetable oil over medium-high heat. Add the ginger and garlic, and sauté until fragrant, about 30 seconds. Stir in the carrots and sauté until crisp-tender, 2 minutes. 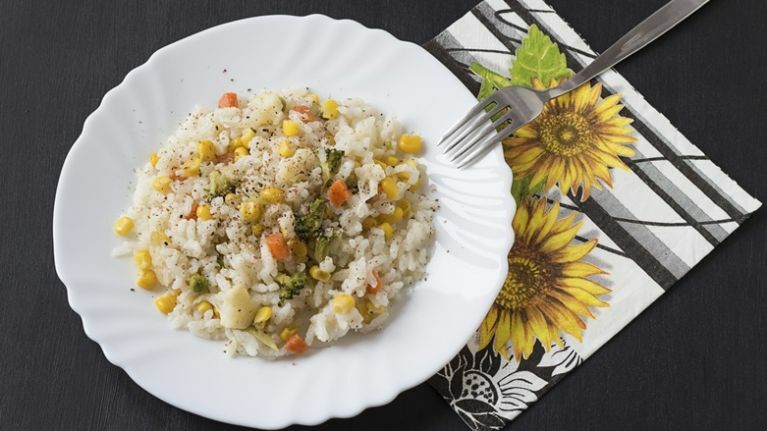 Stir the corn, peas, and cauliflower "rice" into the pan, mixing the ingredients thoroughly. Lower the heat to medium, cover the pan, and cook until the cauliflower is tender, 5 to 8 minutes. Uncover and stir in the eggs, green onions, cashews, and 2 tablespoons soy sauce.